How to escape the feel of overcrowding and stiffness, so typical of big city apartments? 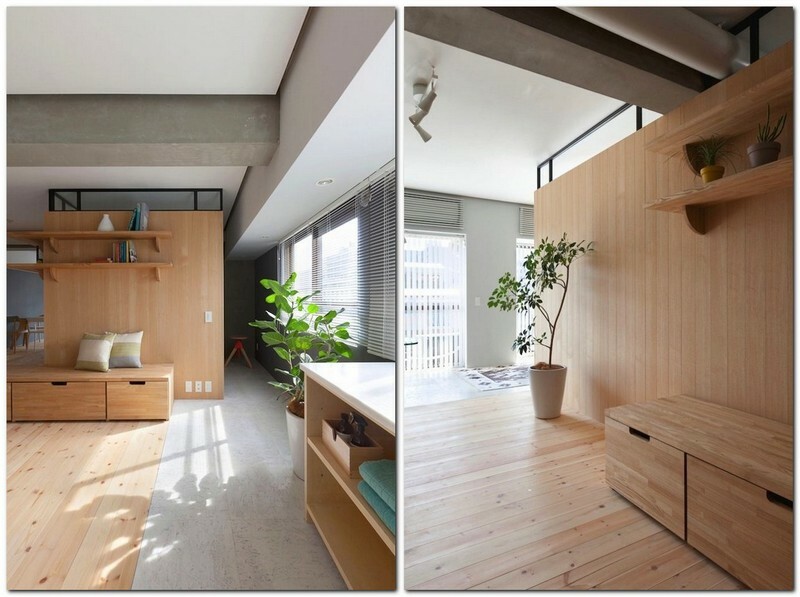 Architects from Japan offered their own vision of a comfortable and inspiring layout: no doors, small wooden partitions and L-shaped plan of the interior, which ensures openness and a required degree of privacy at the same time. Yokohama is a big port city in Japan that not so long ago used to be two separate small fishing villages. Probably, that’s why the inhabitants of today’s most populous municipality of Japan subconsciously strive for nature and spaciousness. The interior of today’s apartment entirely proves this fact. In urban environment minimalist style is a real catch, especially for people, whose jobs demand a portion of creativity. The apartment has just one concrete load-bearing wall, which now separates two bedrooms. 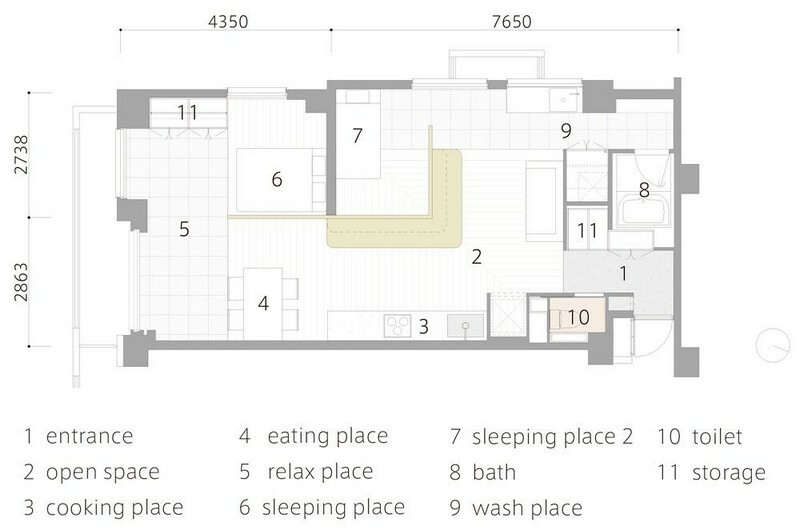 The rest of the functional zones (living room, kitchen and relaxation area) are arranged around them as an open-concept space without a single door. Thus, the young spouses may either spend time together or have some privacy and do their jobs without disturbing each other. 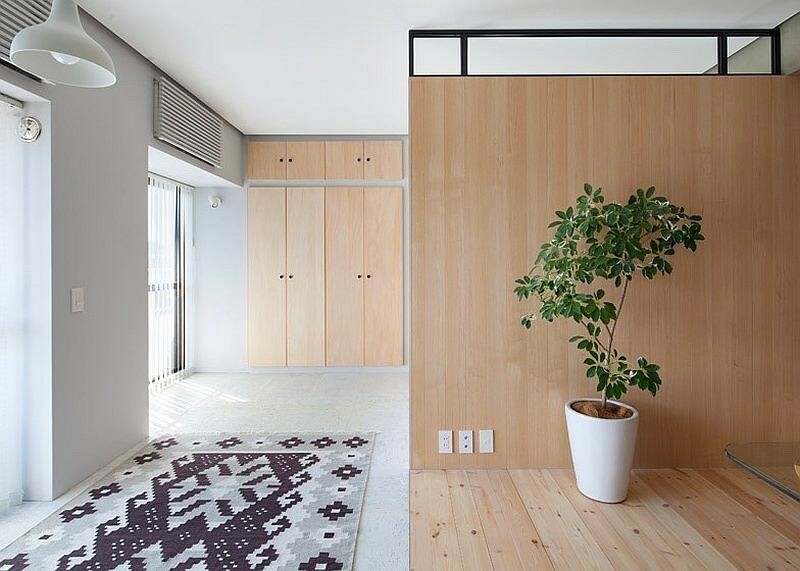 Besides openness, this peculiar L-shaped plan fulfills the space with due amount of daylight from two sides and ensures necessary air circulation. 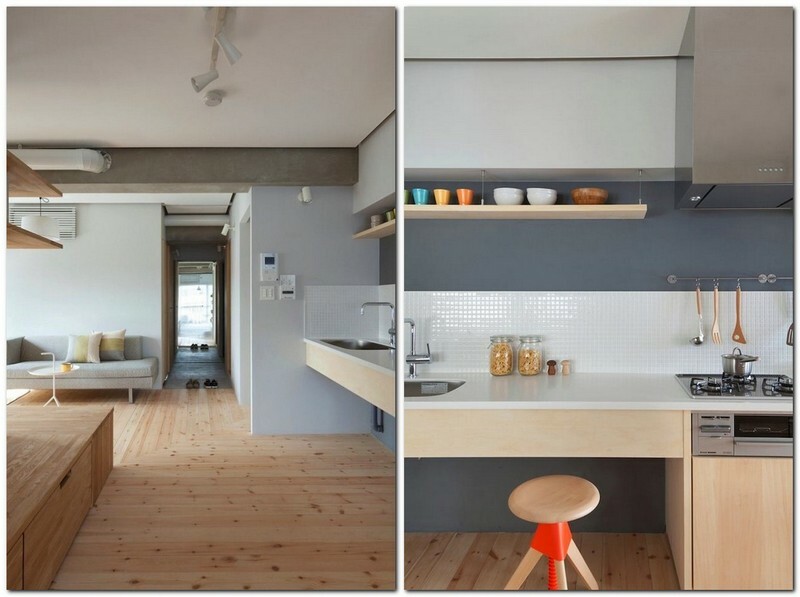 The kitchen is the “soul” of the space and a place, where two parts of the flat meet. By taking a closer look, you’ll notice small gaps between the ceiling and additional wooden partitions, which let natural light penetrate into the most remote parts of the flat. Different functional zones of the space are highlighted by means of partitions made from natural wood and different type and design of the flooring. On the whole, the space is based on plain and laconic lines of the layout and furnishing, and such simple materials as wood, glass and concrete. Their combination creates a cozy, clear and airy atmosphere. 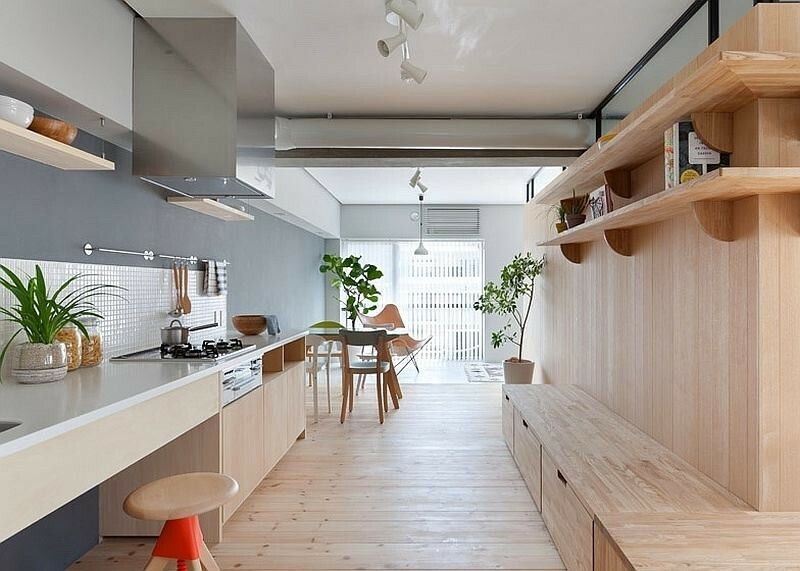 The centerpiece of the flat is a long wooden wall along the kitchen zone. Its top part is organized as a space for creativity featuring long shelves for displaying home décor and accessories, and a few contemporary artworks. 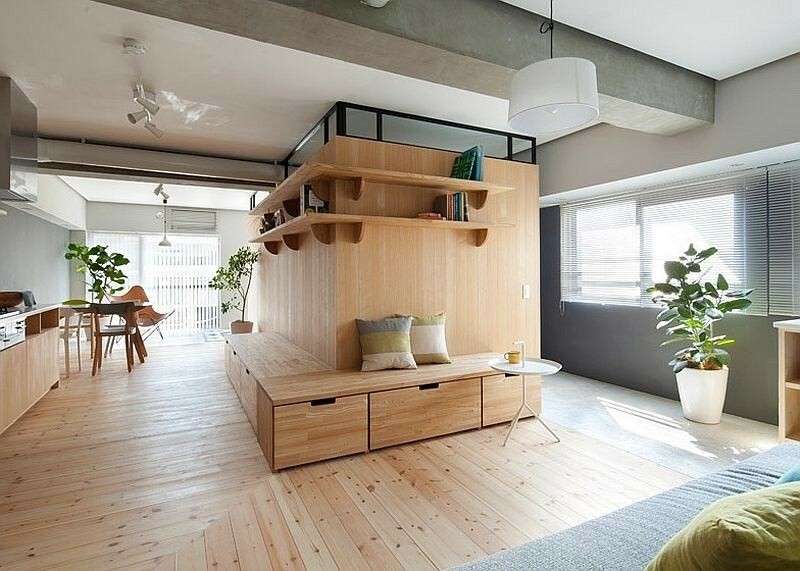 Pay attention that the shelves are not cluttered, which is typical of both Japan and minimalist interior style. And the bottom part is organized as a piece of sitting furniture with a storage zone inside. 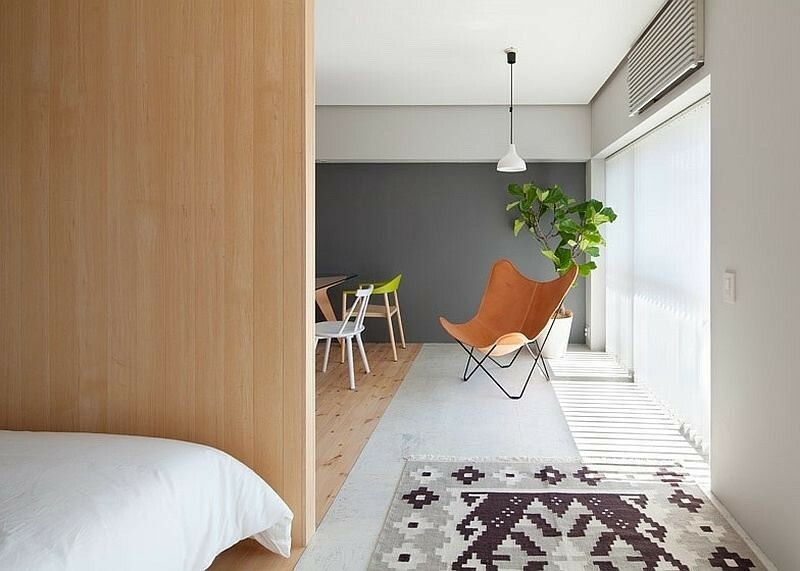 Despite the fact that minimalism mustn’t feature any bright splashes in the primary color scheme, the interior has a few juicy, yet very quiet accents. The sense of coziness is added by a rug, a comfy arm-chair and beautiful potted plants of the mistress. Wooden floor, walls and furniture are combined very originally: they are all made of the same material, but the grain and color of wood are quite different at the same time.